As a development-oriented commercial group of banks, we continuously evaluate the relevance of our actions with regard to our concept of development, which goes well beyond the traditional notion of economic growth. Rather, it is related to a broader sense of responsibility towards the countries in which we operate. We as the ProCredit group continuously assess our actions and decisions, not only from the perspective of profitability and our clients’ needs, but also and above all against the impact they might have on society and the environment around us. With our accumulated in-house expertise, we are perceived as pioneers in the countries in which we operate and our banks have positioned themselves as the partner of choice for green loans. Close cooperation with our clients allows us to understand and support them in their businesses. And, by bringing environmentally concerned businesses together, we provide a forum for discussion, knowledge-sharing and the exchange of ideas and best practices among our client group. 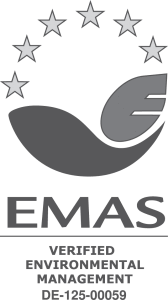 In December 2016, all Germany-based ProCredit institutions received EU Eco-Management and Audit Scheme (EMAS) certification and ISO 14001:2009 certification. The ProCredit institutions continuously monitor their own energy and resource consumption, with the aim of identifying opportunities to reduce our environmental impact and developing appropriate measures.